Sometimes Spirit gives me such a strong energetic message, I have to do something in response! This is what happened to me when I first read in the Fall of 2017 the plans for IEC2018 “Allies of Evolution.” I felt very drawn to serving the BCC in some way. Before I thought about it too much, I sent an email to the planning team of Bence, Barbara and Peter, offering whatever I could that would serve the team and the BCC. 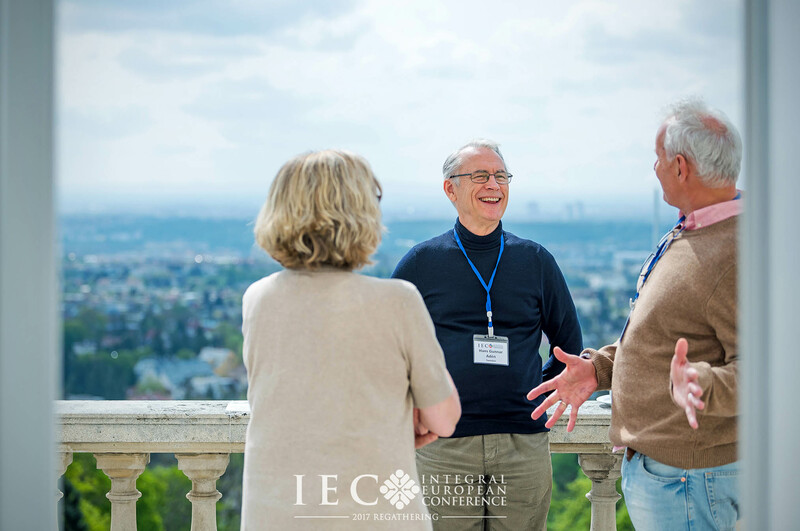 I could give myself good reasons why I wanted to take this leap…My experience as a representative (for the Soul of Canada) at the IEC2016 BCC was profound, so much so, that afterwards I interviewed Bence for an article in The Knowing Field International Journal. (1) Also, for the last couple of years I have been focussing on facilitating collective/ social justice constellations. (I call my work: “Constellating for the Collective: Into our Collective Heart” and I offer workshops monthly in my home city Ottawa, and weekend workshops in other cities.) The groups I had been working with were small — seven to twenty-five people. What would it be like to work with 400 plus people? 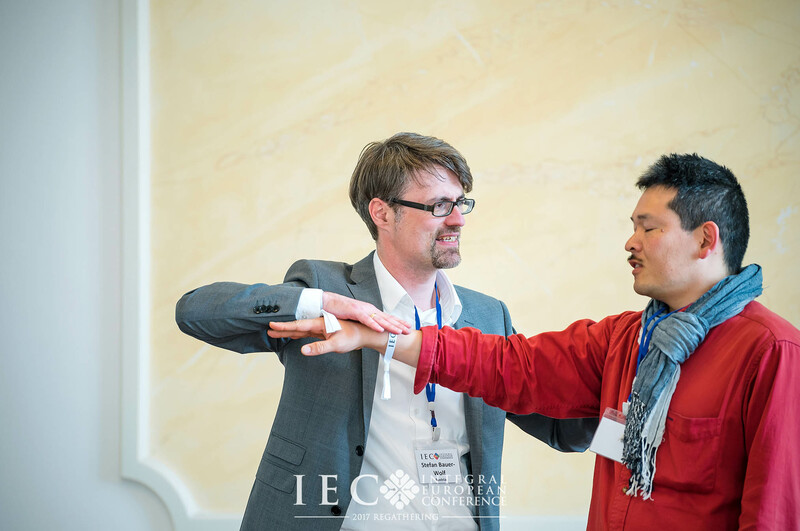 Bence felt resonance with Barbara when they met at the German Integral Conference in June 2015 and they experienced each other’s workshops. 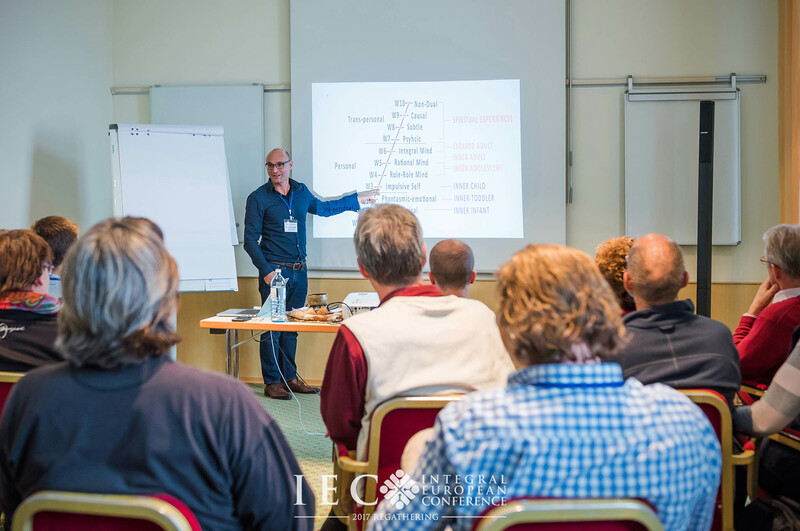 In a pre-conference course on Spiral Dynamics just prior to IEC2016, Peter shared his vision and ideas for the BCC when offering to be an additional facilitator. For both, it seemed right, and Peter joined the team. Brigitte Wingelmayr —with whom Bence had done many workshops — was also invited to join as an elder and a shamanic wise women. 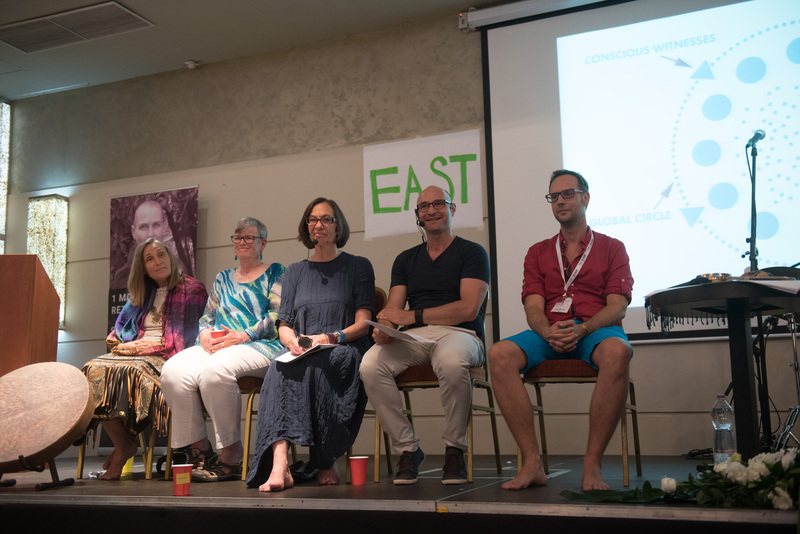 The team for the BCC in 2016 came together and facilitated a constellation for 250 participants on behalf of the Soul of Europe. 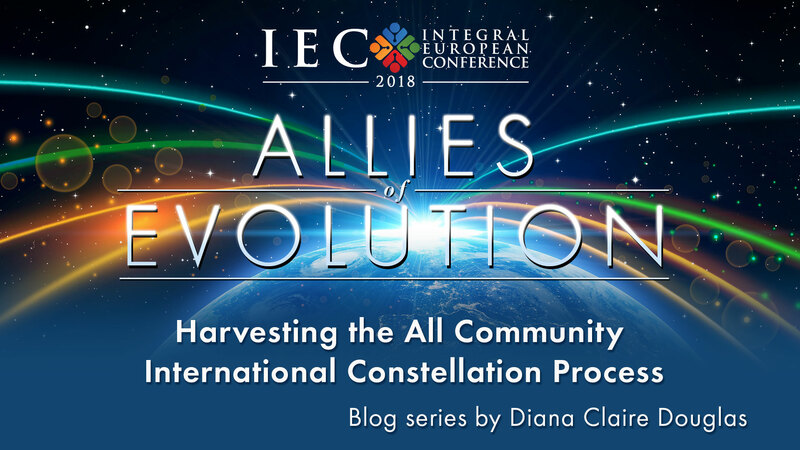 And then in late 2017, IEC2018 sent out the request for proposals for workshops and they announced that there would be another International Big Community Constellation. I felt a rush of intense energy move through me to offer to be of service for the BCC. Part of me thought it was a bit audacious to do so. And yet this energy continued — a form of how guidance works with me! 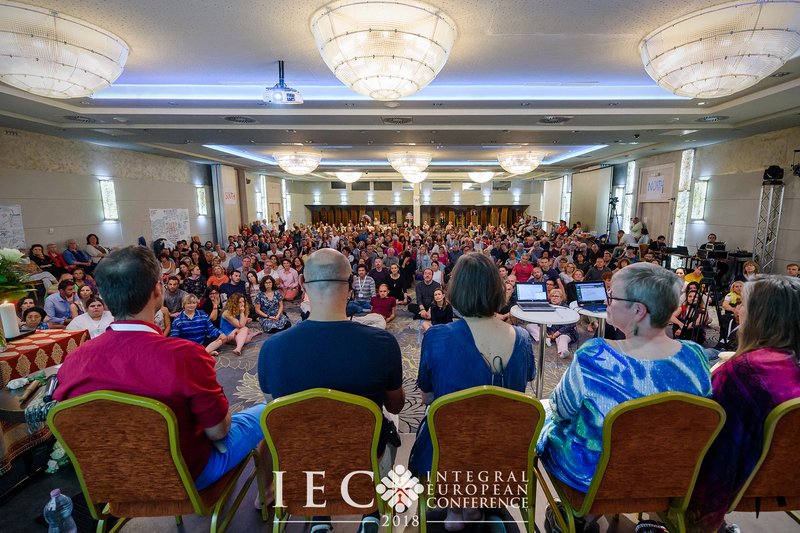 In our facilitators’ debrief after the conference, we all agreed that we had worked together as a team, supporting each other, and open to receiving and acting on each others’ intuitions and perceptions of what was needed. We each fulfilled our roles while being in the flow with the others. And we definitely needed this resonance in order to facilitate such a big community constellation! A deep bow to my co-facilitators and to the “push from Spirit” to be part of this team. 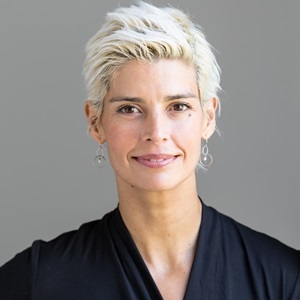 (1) In the Spotlight : Diana Claire Douglas in conversation with Bence Ganti on “Constellating Nations: A Large-Scale Europe Constellation Process,” The Knowing Field International Constellations Journal, Issue # 29, Jan 2017, pp 12-20. Click here to read the interview. Click here to see the facilitators’ brief bios. See Blog #3 for Before the Conference: Preparing for the BCC. Thank you to the wonderful facilitation team for including me! And thank you to all participants who engaged with this process so fully! May this serve restoring peace in Europe. 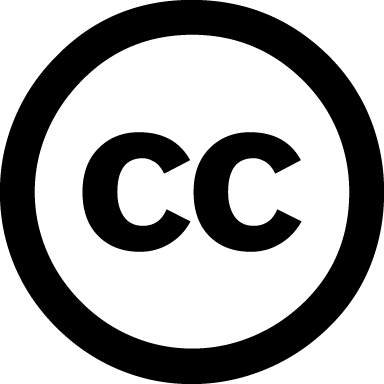 Content on this blog is licensed under the Creative Commons License which allows for non-commercial redistribution, as long as it is passed along unchanged and in whole, with credit to Diana Claire Douglas. 14:00 – 15:00 Opening circle and meeting each other 15:00 – 15:30 Thought Leader Key Speech 15:30 – 16:00 Break 16:00 – 18:00 Afternoon process 18:00 Suggested Program: Have dinner with community, socialize, enjoy the spa and the garden together. 12:30 – 14:00 Lunch and rest 14:00 – 17:00 Open Space (breakout groups) 17:00 – 18:00 Big Circle (harvesting) 18:00 Suggested Program: Have dinner with community, socialize, enjoy the spa and the garden together.